Back when Good Omens first came out, Terry Pratchett and Neil Gaiman had plans for a sequel—one that never came to pass, just like the planned movie adaptation of the novel. But now ideas from the sequel are being given new life in Amazon and the BBC’s TV miniseries remake, in the form of Jon Hamm. Once we had finished writing Good Omens, back in the dawn of prehistory, Terry Pratchett and I started plotting a sequel. There would have been a lot of angels in the sequel. When Good Omens was first published and was snapped up for the first time by Hollywood, Terry and I took joy in introducing our angels into the plot of a movie that was never made. So when, almost thirty years later, I started writing Good Omens for TV, one thing I knew was that our angels would have to be in there. The leader of these angels is Gabriel. He is everything that Aziraphale isn’t: he’s tall, good-looking, charismatic and impeccably dressed. 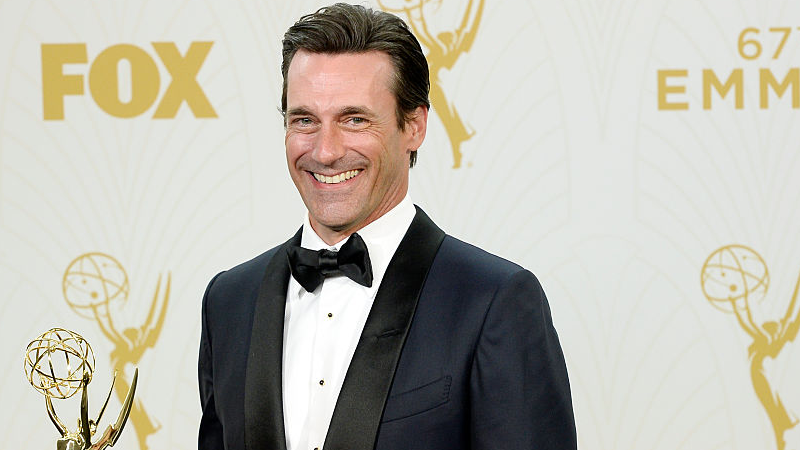 We were fortunate that Jon Hamm was available, given that he is already all of these things without even having to act. We were even more fortunate that he’s a fan of the books and a remarkable actor. Presumably Gaiman’s plans for Gabriel have been altered a bit in the nearly three decades between Good Omens’ release and its revival on TV, but it’s fascinating to see that hooks for the follow up that never came to be are going to be making their way into the new show. Good Omens is set to release through Amazon Prime Video in 2019, followed by a TV broadcast on BBC 2 in the UK later that year.